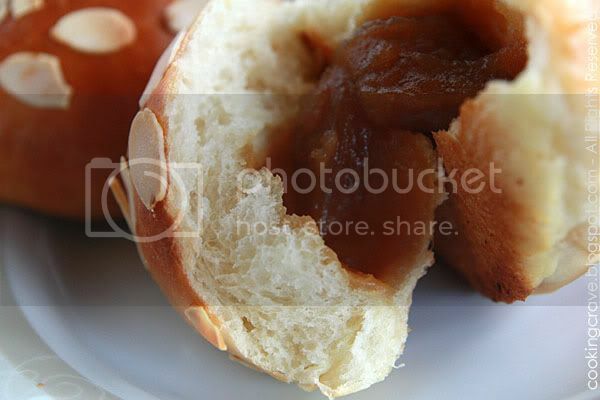 This time I use Wendy's basic sweet buns recipe for making this batch of peanut paste buns. I filled it with the ready made peanut paste I bought from the shop. Anyhow, you can just replace the peanut paste with read bean, lotus or pandan kaya fillings... it's really up to our own preference. 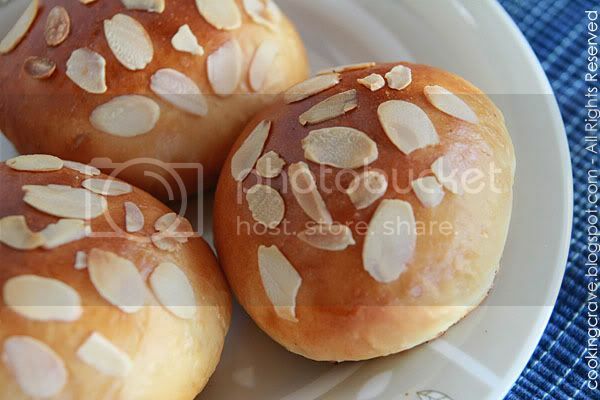 To make the buns look more attractive for photography, I decorate it with some almond slices on top of it. Look at the texture of the buns... it's really fluffy, moist and soft!! Method :(If you don't have bread maker, please refer to - Bacon Onion Roll for the hand mixing and kneading steps). 1. Place the liquid ingredients (water and egg) into the bread pan of the machine. 2. Then add all the dry ingredients EXCEPT yeast. 3. Make a small well on the top of the dry ingredients (not too deep to keep yeast away from the wet ingredients), add the yeast to the well. 4. Select the DOUGH function and press start. 5. My bread maker takes - 5 minutes for first knead (mixing) and 15 minutes for the whole kneading process. 6. I added the butter after the first knead. 8. The dough should be triple in size after 2.5 hours. 9. Punch the dough with your fist to deflate the gas. 10. 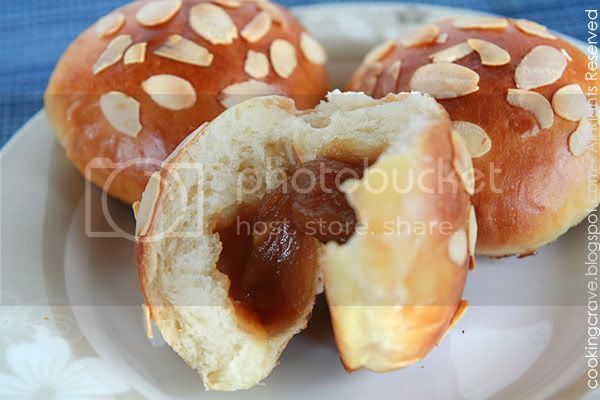 Divide the dough to 60g balls and filled them with the peanut paste. 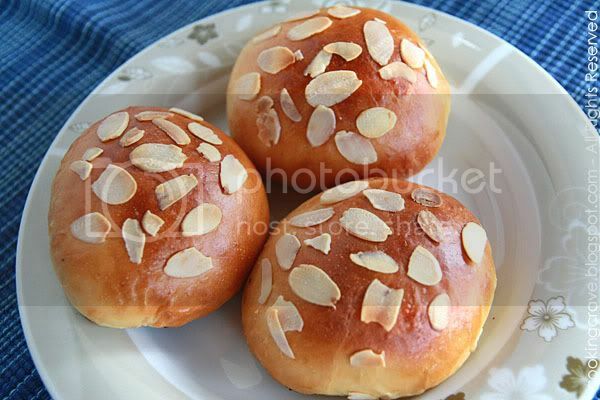 Place the almond slices on top of the buns. Brush the egg & milk mixture liquid and bake it for 13 minutes. Temperature and time are to be adjusted as different oven will bring different condition and result. it seem you baking a lot of buns in these few days, looking forward for the recipe. Ooo...these looks too good! I want one! Hi morning, Amy. I'm Ooi. I was a chef last time for more than 10 years but now I work in IT related job. First time visit ur blog here. 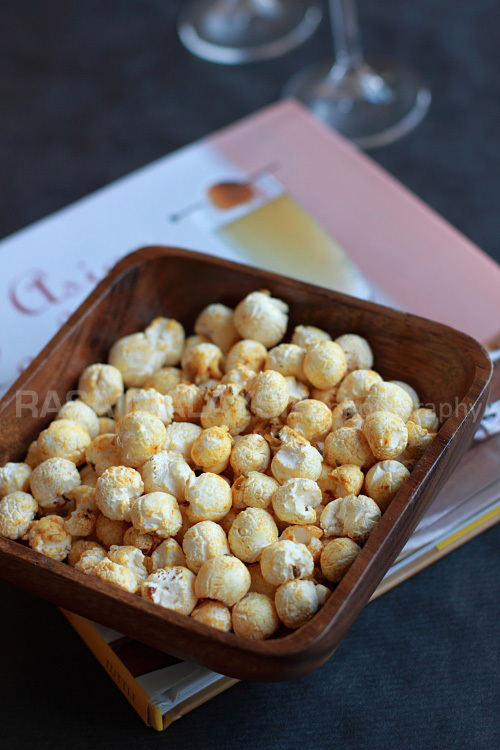 After read ur recipe, there r few of it I pretty like. The cake u made is nice but the bread is just so so only. I'll try ur cake recipe and feed back to u.
ksooi - Welcome to my BLOG! I'm still new in baking bread. It would be great if you can share your bread recipe with me. 10yrs are not a short time, why you didn't con't being a chef?